The Young Professionals in Valuation Program is a formal program designed to bring together the next generation of valuation professionals from across Canada, to encourage member engagement, to provide networking opportunities, to assist in professional development, and to foster a sense of community through networking. Driven by dedicated volunteers and led by the Organizing Committee, the Program is run by the profession, for the profession. The Program is for Members and Students, age 40 and under, though all are welcome to attend events. The Program will host a series of events annually across the country, which include networking with other valuation peers as well as other like-minded professionals. Click below for details on our upcoming events! 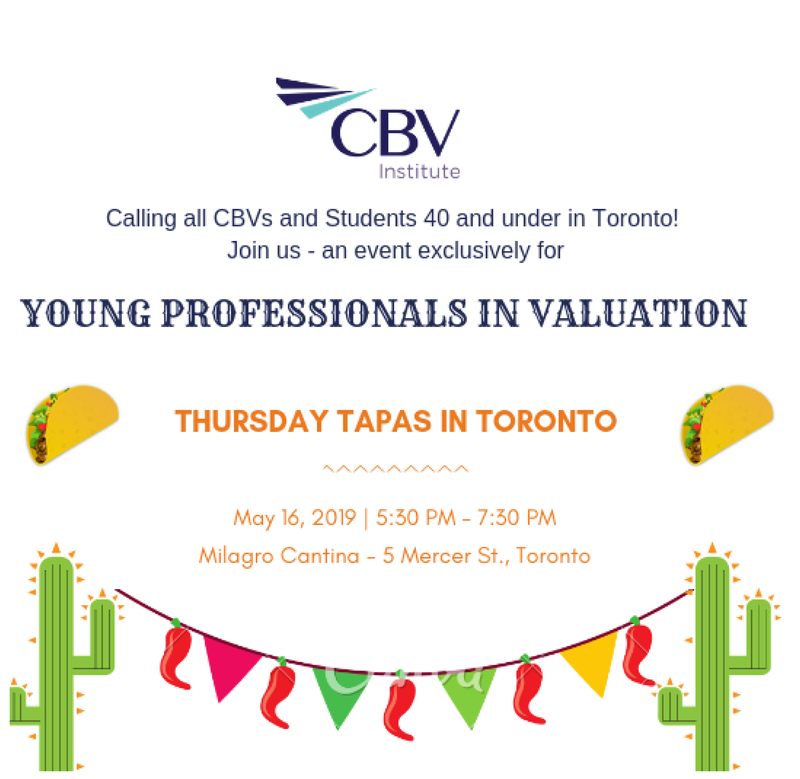 The inaugural event of the Young Professionals in Valuations Program will be held downtown Toronto at Milagro Cantina on Thursday, May 16, 2019. Join us from 5:30-7:30 pm for appetizers, drinks, and some mixing and mingling. This event will be focused on networking, getting to know your fellow valuators, and introducing the Young Professionals in Valuation Program. Click here register. This event is limited to 40 attendees. Mike’s practice includes business valuations, purchase price allocations, and audit support. JT specializes in the valuation of commercial real estate and privately-held business interests. Louise specializes in business valuations for matrimonial and litigation support, tax and estate planning, mergers and acquisitions, financial reporting and economic loss quantifications. Mike is part of KPMG’s Forensic and Dispute Advisory practice, where he practices mainly in the areas of disputes and litigation support. Lucas specializes in valuation and litigation support services of both large public companies as well as shareholdings in closely held private companies. His valuation analyses have been used in the context of M&A, shareholder disputes, matrimonial disputes, financial reporting, and corporate reorganizations. Ian is the Managing Director and CEO of IJW & Co., and advises Canadian and global corporations with business services including cross border M&A, valuation, management buyouts, and corporate finance. ‎Ian is also the co-founder and was a board member of the M&A Club. There are many ways to be involved in the Program. We are always looking for local volunteers. If you have a great idea for an event in your city, please contact us, or any member of the Organizing Committee. We will also periodically send out surveys to gather your thoughts and ideas! If you have any questions or comments or wish to volunteer, feel free to reach out!